“I just wanted y’all to see it before it happens,” said Paul Matta, 47, a school board member who works for the local housing authority and suspects his way of life will disappear with the arrival of heavy industry in his quiet town, a grid of brightly painted homes, tourist shops, and a single restaurant. 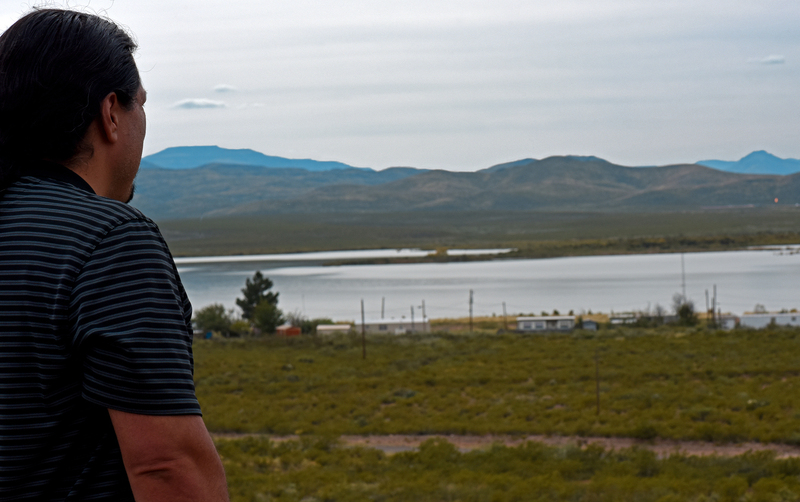 Paul Matta surveys Lake Balmorhea near Balmorhea State Park. In the distance, an orange flare on a recently constructed wellpad burns. Photo Credit: Laura Evangelisto, © 2016. In many ways, the risks Balmorhea’s wild areas now face have been previewed in wildernesses around the world. Ask a local here what makes their region unique and the facts start spilling out. There’s the nearby Marfa lights, which have drawn conspiracy theorists and UFO enthusiasts for decades, and the tiny church building where, local legend has it, Dillinger hid out from the feds in the 1930s. 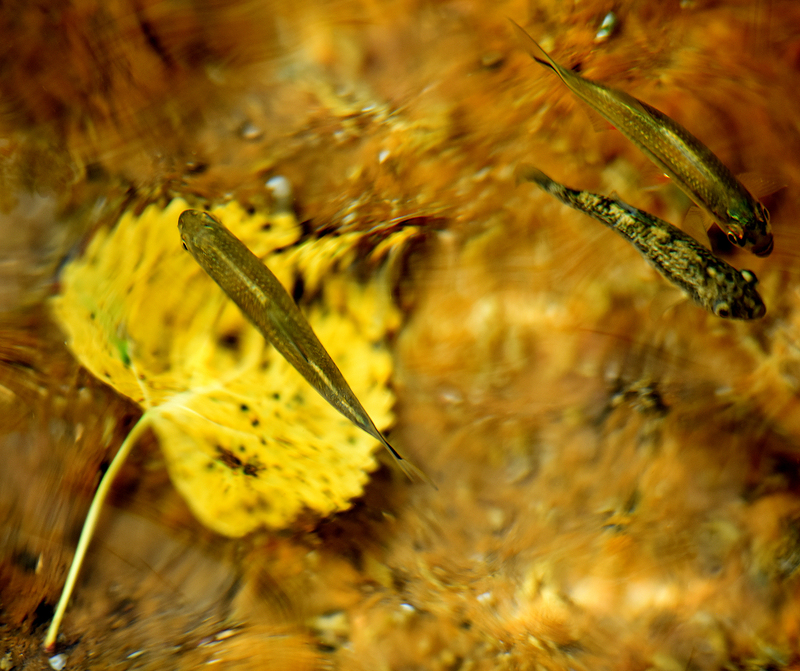 The endangered Comanche Springs Pupfish swims with Pecos gambusia, another endangered fish species, in Balmorhea State Park’s spring-fed pool. Photo Credit: Laura Evangelisto, © 2016. There’s the Phantom Cave springs, where divers probed depths of over 462 feet in 2013, marking the springs as the deepest underwater cave ever discovered in the U.S. (divers were forced to turn back not because they touched bottom, but because their equipment was at its limits). There’s the Comanche Springs Pupfish, a two-inch endangered fish named for its puppy-like behaviors, that can only be found in Balmorhea State Park’s springs (ever since nearby Comanche Springs went dry in 1955) — meaning that swimmers at the spring-fed pool share the waters with hundreds of tiny fish found nowhere else in the world. Even the rocks here can surprise you — pick up an ordinary-looking pebble here, break it open, and you might find a Balmorhea Blue agate, a blue-gray-white swirl of volcanic rock inside a brownish crust. These agates are a tangible hint that (unlike most shale oil and gas prospects), Alpine High lies in the foothills of a volcanic rock formation. The sharp cliffs of the Davis Mountains were formed by volcanic eruptions over 25 million years ago. These days, it’s not volcanic eruptions but blazing natural gas flares that light up the evening skies, so bright that from the horizon they could be mistaken for the last edge of a setting sun. The flares accompanied the earliest stages of the drilling which Apache plans for here. The company estimates that it will pump over 3 billion barrels of oil from the field, which it dubbed Alpine High, at $50 a barrel, plus 75 trillion cubic feet of natural gas. To put that in context, the industry predicts about three times as much oil and gas from the Marcellus Shale — but that prospect stretches across roughly 90,000 square miles, including most of Pennsylvania and into other states, including New York, West Virginia, and Ohio. By contrast, Apache’s Alpine High acreage represents roughly 500 square miles of land, and the oil and gas that the company seeks to drill lies in stacked layers of rock formations underground. “This really is a giant onion that is going to take us years and years to peel back and uncover,” Apache’s Chief Executive Officer John Christmann told analysts at a Barclays conference in September. Energy industry analysts have been abuzz about the discovery, marketed as the biggest find of 2016. In September, Apache announced it had leased more than 300,000 acres of continuous parcels of land in the Alpine High prospect, allowing it to drill 3,000 or more oil and gas wells in Reeves County. So far, a relatively small number of wells have been drilled and fracked — less than a dozen as of August 2016. For Paul Matta, Apache’s arrival has already brought a series of nagging worries, not just concern that drilling accidents and chemical spills could contaminate the region’s unique springs, but also the risk that the water-thirsty process of fracking will parch the springs dry. He also fears that seismic activity, whether from earthquakes or simply heavy machinery and industrial activity, could shift the spring’s underground geology, stopping the water from naturally flowing to the surface. Apache has promised to “minimize” its use of fresh spring water during drilling and fracking. The company also says it will take extra steps to protect the local springs, including a plan to refrain from drilling under the state park and town, even though it has leased the oil and gas rights there. The driller is also funding research to document the current state of the area’s water and is working with the local observatory to try and keep light pollution down, company spokesperson Castlen Kennedy told DeSmog. “Alpine High is a multi-decade commitment for Apache Corp. as is the protection and well being of the surrounding communities,” she said in an email. And what happens out in this corner of Texas — so remote that locals say they make the multi-hour trek out to a grocery store just once a month — not only could put locals at risk, it could also affect the entire planet’s fate. In October, Earthworks visited Reeves County and recorded plumes of methane leaking out of tanks, compressor stations, and drilling sites, using a special FLIR camera to reveal the normally invisible gas clouds. Methane, a greenhouse gas that’s 86 times more powerful than carbon dioxide, has scientists warning that leaks from oil and gas equipment could release enough greenhouse gases that relying on natural gas instead of coal for electricity might be a step backwards for the climate. And in Texas, environmentalists say that little is being done by state regulators to curb the oil industry’s methane leaks. From metal rocking chairs on their front porch, Neta and Darrel Rhyne sat with Paul Matta and mulled over the fate of Balmorhea in the face of Apache’s arrival. The two run a SCUBA shop near the state park, supplying gear to tourists who visit from around the world to dive the local springs and to brush shoulders with an increasingly rare way of life. Neta Rhyne sits on the porch in front of the dive shop she runs with her husband Darrel near Balmorhea State Park. Photo Credit: Laura Evangelisto, © 2016. Drilling and fracking could harm the springs many different ways, an in-depth analysis commissioned by Earthworks concluded in November. The researchers found threats were posed by spills, underground migration of gas or chemicals, and changes to the artesian pressures underground. The Rhynes worry that if the water here goes bad, they will face a nearly impossible battle to hold the driller accountable. A researcher from a nearby university had offered to conduct water tests, but then gave media interviews supporting Apache, causing the couple to worry that his loyalty might lie with the company if a legal dispute arose. Independently testing their four water wells before drilling started would cost $55,000, the couple was told. The oil industry in Texas has a history of problems with environmental racism, with one study last year finding that fracking wastewater wells were disproportionately concentrated in low-income and Hispanic neighborhoods in Texas’ Eagle Ford shale region. Born in Oklahoma and Texas respectively, Neta and Darrel grew up around the oil industry, living together in an area called “refinery row” in the early 1980s. Then in 1984 Darrel was appointed manager of the state park, and he and Neta moved out to the desert. Over twenty years later, that lung cancer has yet to return. “My oncologist still shakes his head, and says ‘I don’t know why you’re here, but …’” Neta said with a laugh. The night skies of West Texas may soon face more light pollution as drilling and flaring extend further into the desert. Photo Credit: Laura Evangelisto, © 2016. 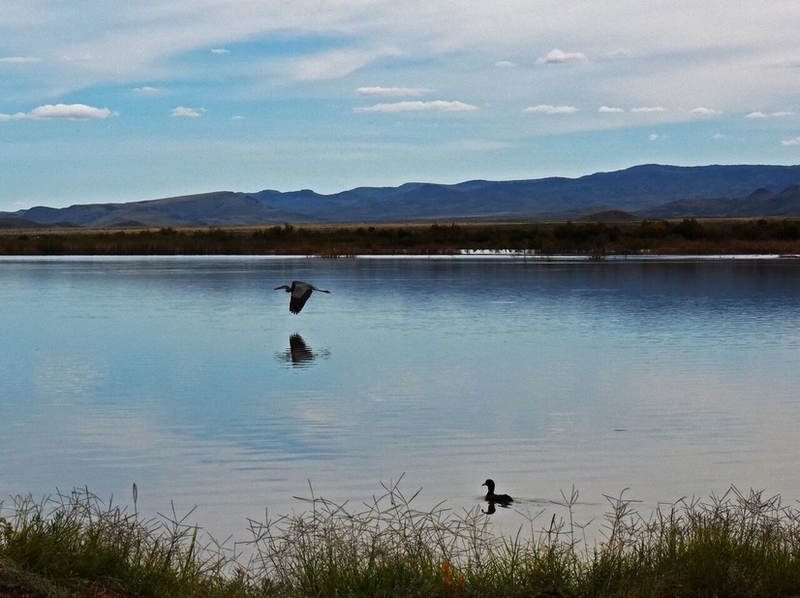 For now, the couple is instead working on figuring out how to prevent Balmorhea from turning into little more than another oil field. They’ve helped form a grassroots group called Save Our Springs Too and organized community meetings for locals to learn about drilling and to discuss the risks posed. In late December, the Rhynes announced that they would welcome those concerned about fracking around Balmorhea and neighboring Toyahvale, Texas, to come visit and to camp out on their land. This entry was posted in Energy markets, Environment, Free markets and their discontents, Global warming, Guest Post, Politics, Regulations and regulators on February 2, 2017 by Yves Smith. Once destroyed it will never return to what it was.Nothing seems to be sacred when some corporation can make a buck on it. I grew up in the oil patch of Odessa/Midland. The Balmorhea State Park is indeed a hidden gem. I did my SCUBA checkout dive there, but I had visited it numerous times before as a child. The water is rather cold, but extremely clear. Truly amazing to find a crystal-clear pool that large in the middle of West Texas. Make no mistake, if the oil industry has their way, it will never be the same. Apparently nothing is sacred in America anymore, not the truth, and certainly not the environment. The choice is NEVER for clean water, clean air, wildlife and the People. Cloaked in the deceptive language of “development”, “energy needs”, “balance” and “progress”, It is ALWAYS for the short-term monetary benefit of a few. Once violated, it cannot be restored. I wish them well in whatever resistance they can raise. It is such a poignantly beautiful place, and jackiebass63 is right, it cannot return to what it was if destroyed–certainly not in our lifetimes, probably ever. This is hype to run Apache’s stock. They’ve drilled 100+ expensive horizontal wells in the area in 5 years and so far have about 2 million barrels of oil to show for it. Apache found something else there, too – something Keenan won’t talk about, for fear of revealing the secret of Alpine High. But, whatever it was, it told him every well in the play would strike oil. The Spanish Trail well mentioned here has made 5,600 barrels of oil in a year. The production data that they have to report to the Railroad Commission also shows a completely different story. The “Phantom” field, for instance, has 7 wells in it, each averaging 170 bopd. Down from about twice that this time last year. At $8 million a well, that’s not great. And that’s the big one. The rest of the fields aren’t even worth mentioning. Thats interesting – I’ve been curious about this story, I found it very hard to believe that so much oil could be undiscovered in Texas so late. I’d be interested in hearing Arthur Bermans take on this, he’s one of the few analysts who can cut through the industry bull. There’s only one man who can stop Alpine High — Putin! Recent intelligence reports show that Russia is interested in influencing more than just America’s elections. Russian President Vladimir Putin and his cronies have taken aim at undermining the U.S. energy industry, as well. Buried within the U.S. intelligence community’s report on Russian activities in the presidential election is clear evidence that the Kremlin is financing and choreographing anti-fracking propaganda in the United States. By targeting fracking, Putin hopes to increase oil and gas prices, destabilize the U.S. economy and threaten America’s energy independence. Great post, thanks. I hope Craig is right and this fizzles, but they will do plenty of damage in the meantime. Glad I visited Balmorhea in better times. It is exactly as described, a real jewel. The company plans to refrain from drilling under the state park and town even though it holds the mineral rights there. OK, how did it get them? By paying for them. Paying whom? Well, I’d guess the State of Texas, for the state park, and landowners in the town for the rest–landowners some of whom are likely to be neighbors of the folks interviewed. It’s a point worth repeating and repeating: oil and gas companies, and mining companies, can’t just show up and take–take land for drilling under, or digging into; take water for fracking or anything else. Those companies have to lease or buy the rights from those who hold them. If the residents of an area don’t want the proposed activity, they can say no. This is a situation that lets you learn who your neighbors really are. By the by: There’s no guarantee that the land owner also owns the mineral rights; those rights may have been sold in the past by a previous owner. The company coming in will have found out who the owner is (they have people called landmen for that). Lots of landowners have had nasty surprises. ‘Nother point: The residents don’t know what chemicals are used in the fracking, and the fracking companies don’t even have to tell the state regulators. Start here: google FracFocus.org / fracfocus chemical disclosure registry. You can check nearby wells from the website. And state regulators have gained a great deal of authority over fracking practices since 2014. Texas is the largest producer of oil in the country, and a lot of the workers are Texans and they don’t want their kids drinking contaminated water any more than anyone else does. Point: Agates are not volcanic. They form in hollows in volcanic rock.